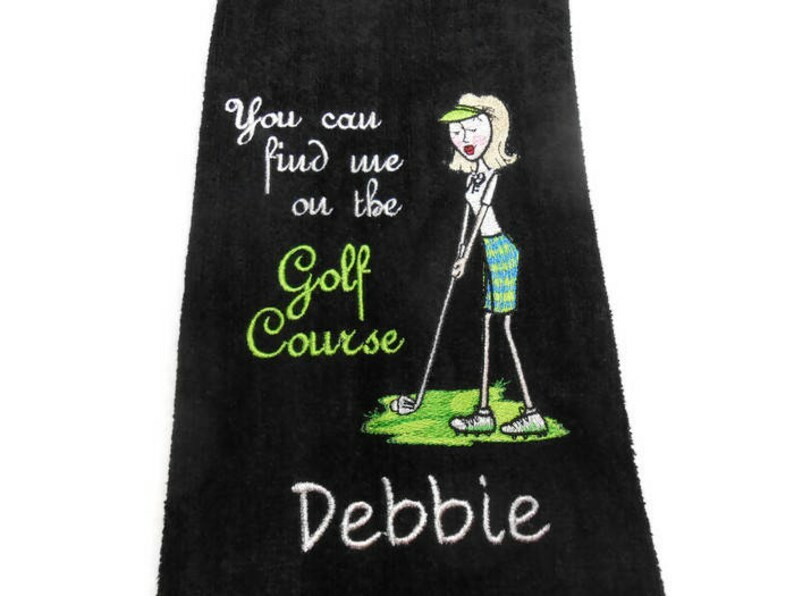 This all cotton velour golf towel is a great fun gift for the lady golfer. Great quality golf towel made of 100% premium plus cotton with plush velour finish. There is a funny saying embroidered on this large sized thick towel. You can find me on the golf course. The design measures approximately 5.25 X 3.25 inches. The hair color, etc., can be changed at no charge, if you'd like. Towel can be personalized. If you choose that option, please leave the name in the note to seller box during checkout. The towel also comes in hot pink along with other colors shown. I love this towel. Seller was more than happy to do a custom order. The shipping was fast and the towel is a great quality. Would buy from again! Beautiful quality and embroidery. This is a wonderful, personalized gift. Thank you.